It's been a bad year for Arizona off the court, and pretty rough on the court, as well. Just a few more days until the calendar turns to March, but March Madness tips off Monday night as the Atlantic Sun tournament begins. So let’s look at how the bracket is shaping up entering the first week of tournament season. First, some reminders. The bracket holds 32 automatic bids for conference champions (noted with italics), and the remaining 36 are at-large selections. Teams are evaluated by how they have performed to this point in the season without projecting how they will perform the rest of the year. Conference champions have been selected using No. 1 seeds for conference tournaments beginning this week, and using KenPom projections for No. 1 seeds in tournaments that begin next week. 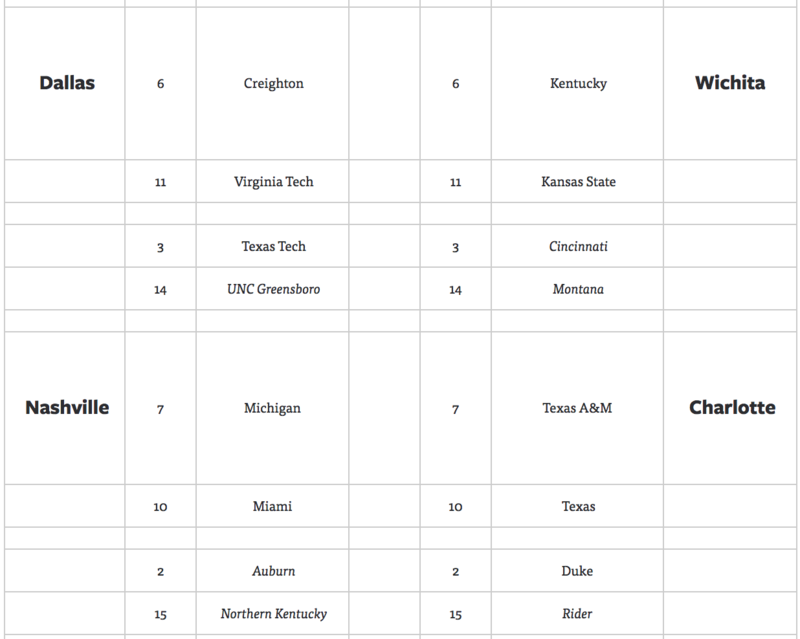 ** It’s hard to imagine a scenario where Virginia (1 seed, South) is not the overall No. 1 seed on Selection Sunday. The Cavaliers have been safely in the top spot for weeks, and Villanova dropping three of its last six has widened the gap. With an 8-1 record against Quadrant 1 and no losses outside the top two quadrants, Virginia would likely need to lose three games (the maximum with only two games left in the regular season) to put their standing in danger. ** Meanwhile, Kansas (1 seed, West), in locking up a 14th straight Big 12 title, effectively locked up a No. 1/No. 2 seed for the ninth straight year. 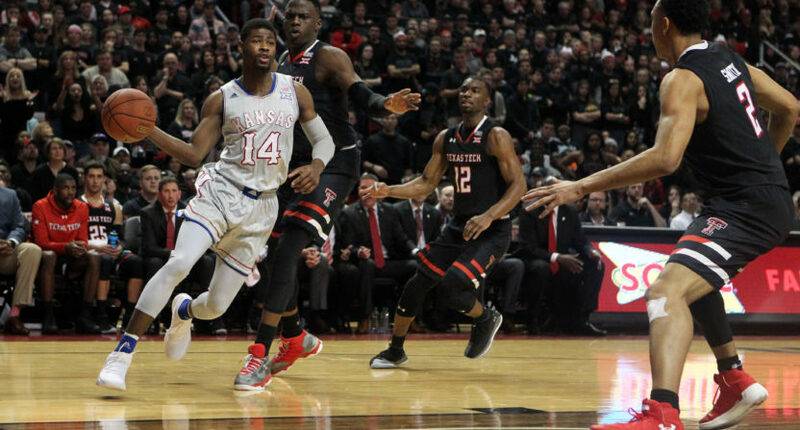 The Jayhawks are now 11-3 against Quadrant 1 and 7-2 against Quadrant 2 with two more of the latter coming up this week as they wrap up the regular season. So despite some of the head-scratching home losses, Kansas is leading the battle for the final No. 1 seed as of today. ** It was a rough week for the Pac-12. UCLA (fourth team out) dropped out of the field after losses to Utah and Colorado. Washington (third team out) lost to Stanford. Utah (fifth team out), after the nice win over UCLA, got beat badly at home by USC. If any of those three lose another game this week, it’ll need a deep Pac-12 Tournament run to feel comfortable on Selection Sunday. 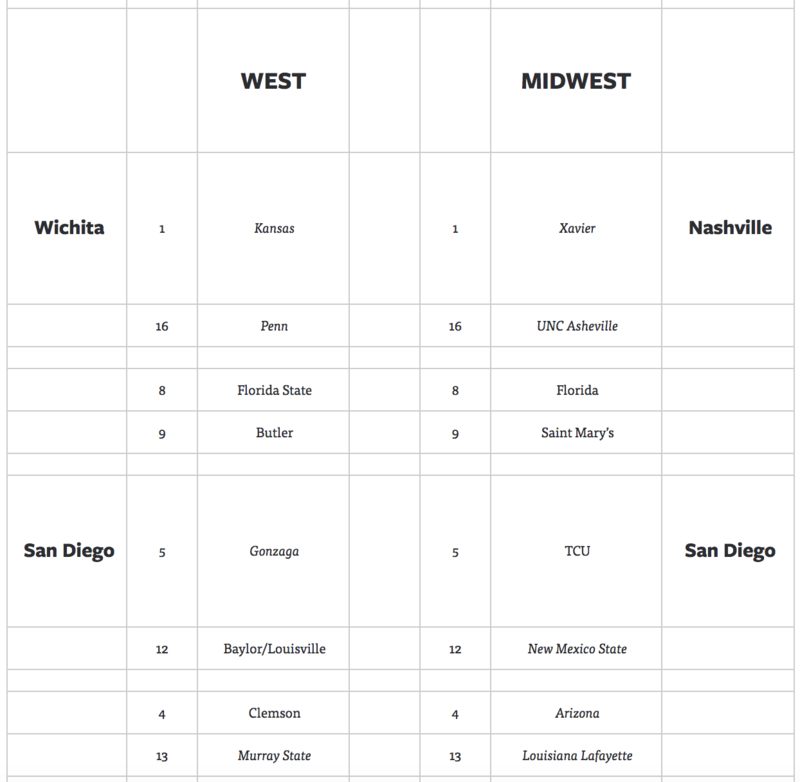 ** Houston (6 seed, Midwest) and Wichita State (4 seed, South) are two of the biggest risers over the last few weeks out of The American, even though Cincinnati (3 seed, East) has fallen a bit. Houston has now racked up a 6-2 record against Quadrant 1, helping to offset a couple of bad losses early in the season. Wichita State has won six straight games and can get two more quality wins this week against UCF and Cincinnati. ** It’s been a bad year for Arizona (4 seed, Midwest) off the court, and things haven’t exactly been great on it either. The Wildcats fell back to .500 against Quadrant 1 with Saturday’s loss at Oregon, and they have three losses against Quadrant 2. They have an easy week to finish the regular season, hosting Stanford and Cal, and a loss in either game would likely eliminate the Wildcats from a top four seed. Depending on how the teams behind them perform, the Wildcats may even need to win the Pac-12 Tournament as well to keep geographic advantage. ** What do we do with Florida and Alabama? 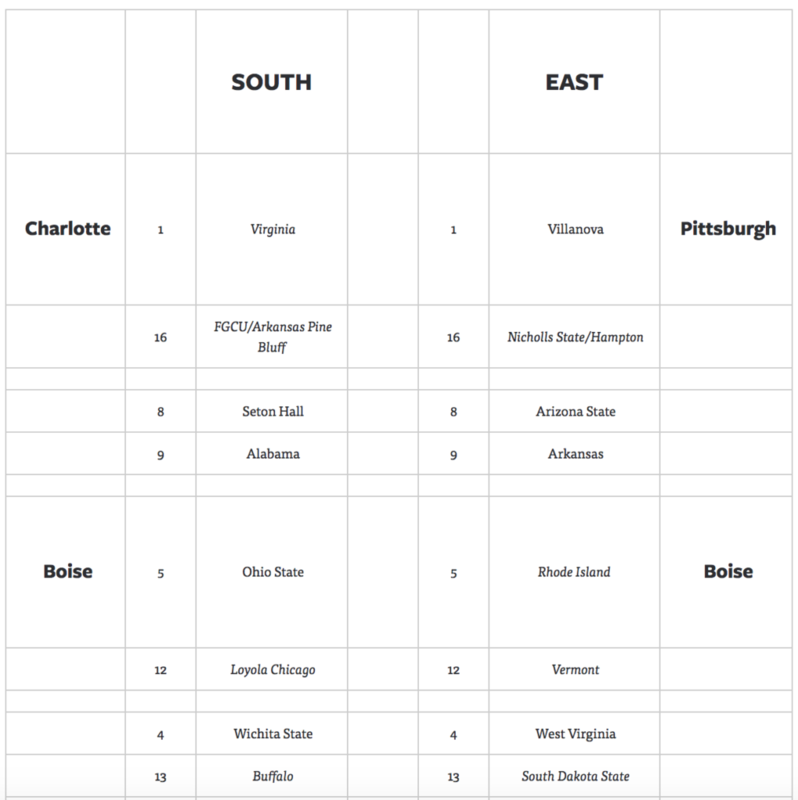 The Gators (8 seed, Midwest) are a perfect example of how the selection committee uses RPI in a funny way, where it’s less about your own ranking and more about the rankings of the teams you beat. They rank No. 56 in RPI but have an 8-4 record against Quadrant 1, which suggests they’re pretty good against clear NCAA Tournament teams. 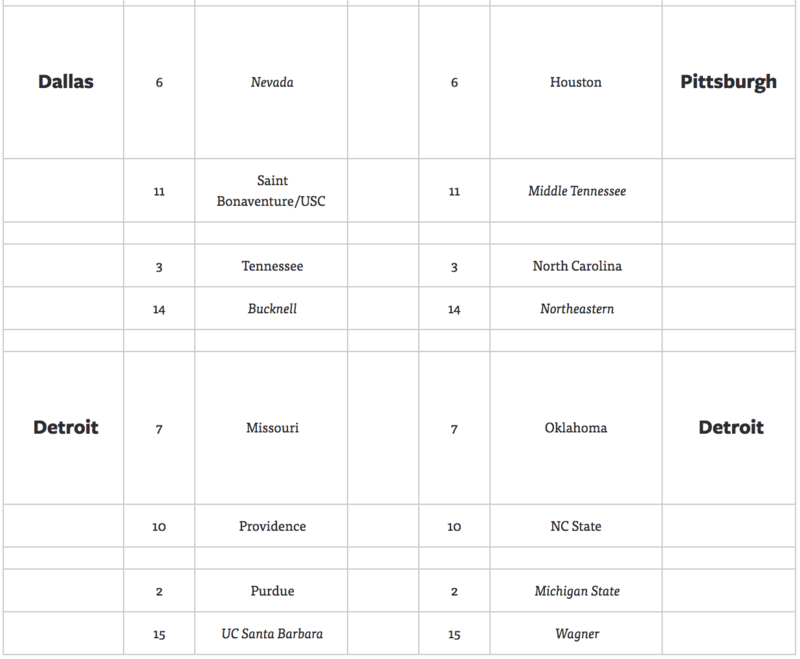 However, they’re also 3-7 against Quadrant 2, which suggests they’re not so good against other bubble teams. Florida is safely in the field for now, and they can feel really comfortable entering the SEC Tournament if they can get one win this week against Alabama or Kentucky. Meanwhile, Alabama (9 seed, South) has some similarly funky numbers when sorted into the quadrant system. The Crimson Tide is 5-6 against Quadrant 1 and 6-5 against Quadrant 2 with one loss to Quadrant 3. Similar deal for them: if they can beat Florida or Texas A&M this week, they’re in good shaping entering conference tournament season.